Dental pain doesn’t just hurt – it’s destructive. Dental pain is a threat to lives and livelihoods. Most of us have suffered from toothache (oral pain) at some point in our lives. It can be debilitating, constant, and excruciating. It is something we would immediately look to address by reaching for pain relief or booking an urgent visit to the dentist. But for many people, this is not possible; over 70% of the world’s population does not have access to a dentist. And it is in the rural areas of developing countries across Africa and elsewhere that dentists are most sorely needed. As traditional diets increasingly incorporate sugar-filled western foodstuffs we are seeing dental decay rise dramatically, leading to debilitating and painful tooth infections. Experiencing pain, problems with communicating, eating and smiling due to dental decay leave people ostracised from communities, unable to work or attend school. It is estimated that toothache is the reason for millions of school and work hours lost each year throughout the world. Lacking access to basic dental care is a serious problem, and if not treated appropriately, can lead to infection and even death. Our mission is to provide access to simple, safe, emergency dental treatment to all. Our sister charities (Bridge2Aid UK and Bridge2Aid Tanzania) have developed a model that provides effective practical emergency training for local health workers. 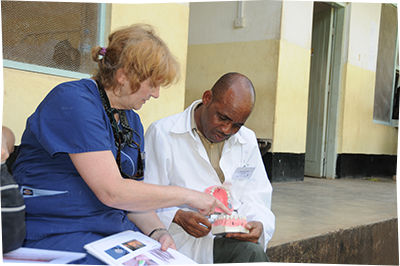 The training is carried out by volunteer dentists, nurses, assistants, hygienists and therapists. For over a decade Bridge2Aid has demonstrated success in both Tanzania and Rwanda, making access to life-changing treatment available to more than 4 million people. Bridge2Aid Australia has been set up to bring our Aussie expertise, passion and to the work of the organisation. The training programme consists of training local health workers to diagnose dental conditions, administer local anaesthetic, extract teeth and provide post operative management, refer complicated cases, manage cross infection control and safe sterilisation, deliver basic oral health promotion and prevention, and advice on products that will help, and identify other oral problems (such as early signs of HIV, oral cancer, and poor oral hygiene). Sustainability is at the heart of what we do. To us sustainability means putting the knowledge and the power to change their lives into the hands of the people who we are seeking to help. We want to be a catalyst for change, to set change in motion, but we don’t want to disempower the people in whose communities we are working. We are after all (well intentioned) guests in their country. In developing our programmes we are meticulous in looking at the existing healthcare networks and structures, as well as cultural mores. We want to ensure that the training we deliver is appropriate to the situation. Crucially when our volunteers leave an area the skills they have taught mean the work can be carried on, with the tools that we can leave with those we have trained. This is why our model comprises of teaching primarily extractions using hand instruments. 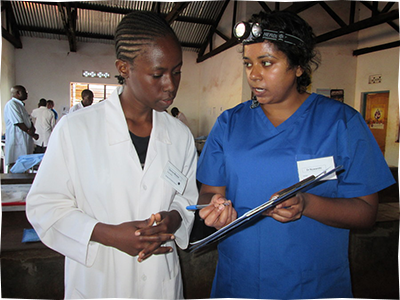 The health workers we train usually are usually in remote rural areas with little or no electricity or running water. When our team leave we leave behind competent health workers now trained in emergency dental care who are able to get people out of pain and prevent dangerous infections. We’re leaving a long term legacy of ongoing pain relief.